Also known as “designer dogs,” Teddy Bears are hybrid crosses between small dog breeds like Bichon Frise and Poodles, Chihuahuas, etc. Breeders are still experimenting with other breeds like Miniature Schnauzers. If you want a dog that is cuddly, loving, easy maintenance, and easy to train, a Teddy Bear may be just the right dog for you. The name given these hybrid dogs really says it all. They are adorable fluff balls of love. They were originally bred as therapy dogs for children with handicaps, and are still used in that capacity as they are highly intelligent, trainable and loyal. Teddy Bears are perfect pets for city dwellers that live in apartments, but they also thrive in suburban settings. Anywhere their human may be is where they will do well. They have also been bred to be hypoallergenic in most cases, with little to no dander, and so are wonderful pets for those who have allergies. Small dogs have often been characterized as having anxious or hyper temperaments, and being yippy animals, but not so with the Teddy Bears. These loving companions are very laid back and mellow, and get along with everyone – other dogs, and especially children. They also are great for couples as they will easily bond with both of you. Teddy Bears may be small and look like stuffed animals, but their size hides a big intelligence. They will remain small throughout their lives, but are very quick to learn and extremely affectionate. You can’t look at a Teddy Bear dog and not fall immediately in love. These dogs are very cute, sweet, and smart. 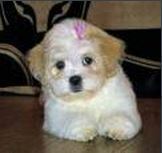 If you are looking for a small dog and don’t want the usual small dog personality, a Teddy Bear could be for you.